Haws 7612 Stainless Swing-Away Sink Mounted Eye/Face Wash mounts on the sink top and makes it simple to have an eyewash at a sink in addition to having it out of the way when not needed. It has the AXION MSR™ Eye/Face Wash Head which directs the flushing fluid away from the nasal cavity. 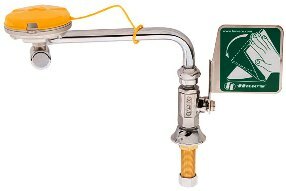 Purchase with Haws 9201EW Mixing Valve below to ensure water temperature is within ANSI guidelines.